Alvin and the Chipmunks - The Chipmunk Adventure would not be my first choice for an animated around-the-world adventure flick. I've never really understood the appeal of Alvin and the Chipmunks , three characters with really annoyingly high-pitched voices that sing and cause trouble. I guess maybe they're considered cute? Well, whatever the appeal, they've been around for a while and it seems they're here to stay. This feature-length animated film is actually over 20 years old, though you'd never notice by the quality of the DVD transfer. It looks as clean and crisp as any modern day cartoon. And having an around the world adventure works for just about any decade. Now obviously this film was made for children. There is no double meaning of jokes like those found in Shrek, so anyone over the age of innocence probably wouldn't give this a second thought. And although I don't think around-the-world adventures make for great stories, I have serious issue with how they actually do it in this film. Okay, so Dave Seville is the adoped dad of the three chipmunk boys, Alvin, Simon, and Theodor. Now, he has to go on a business trip to Europe, so he has Miss Miller come over and watch the kids while he's gone... and here's issue number one. Miss Miller is completely incompetent. She is a danger to herself, the kids, and everyone else. Yeah, I know this is supposed to be funny, but I just find it disturbing. How could Dave leave his children with this crazy woman?! They travel around the freakin' world and she never even realizes they're gone! Okay, so the chipmunks are playing an arcade game with the three female chipettes, Brittany, Jeanette, and Eleanor. The game involves flying a hot air balloon around the world. Nearby sits an evil woman and her brother, and they decided that the best way to get their diamonds exchanged for cash all around the world is to trick these two groups of kids into doing it for them... WTF?! I don't know about you, but if I had a bunch of diamonds that I absolutely needed to get to certain spots around the world, I most certainly wouldn't get a bunch of kids to do it using hot air balloons, especially kids I don't even know who I just happen to see playing a videogame. That's simply stupid. How does she even know that they can work a real hot air balloon? Anyway, she pits the two groups of kids against each other, so they each take off in opposite directions. And surprisingly, they actually do pretty good. At each drop, they successfully trade their dolls filled with diamonds for dolls filled with cash, even considering that a third party knows about them as well, and tries to intercept the dolls at each drop. Eventually the kids do catch on to what's going on, and that's where the real trouble begins. Oh, and I forgot to mention there's a couple of musical numbers here. They weren't terrible, but nothing I'd have a desire to listen to. Taking a look at the front cover of this release, I realize that it does not actually represent what takes place in the movie. 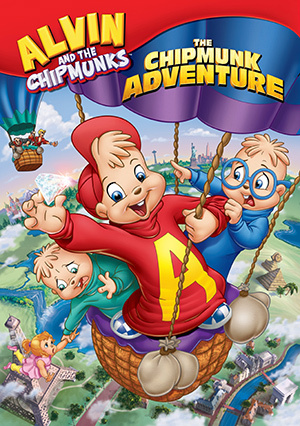 The three chipmunks are on a hot air balloon with Alvin being front and center, holding onto a giant diamond with a huge smile on his face while Theodore is trying desperately to hold on to Brittany so she doesn't fall to her death hundreds of feet below and Simon is pointing at the second hot air balloon carrying the two villains who are chasing after the chipmunks. Okay, so where do I even begin? The diamonds aren't that big, and the chipmunks certainly aren't happy to find out that they've been used to smuggle diamonds. The villains don't chase the chipmunks in a balloon of their own, and where the heck are the other chippetts? This picture makes it seem as if they've already fallen to their bloody demise, with Brittany soon to follow. This DVD release contains a bonus CD that has eleven tracks of music from the movie. I don't recall there being any other extra features, except for maybe some artwork. All-in-all, I didn't like the film. But I'm sure kids won't mind it, especially if they already like Alvin and the Chipmunks. Alvin and the Chipmunks - The Chipmunk Adventure , released by Dreamworks, is available starting April 1, 2008.